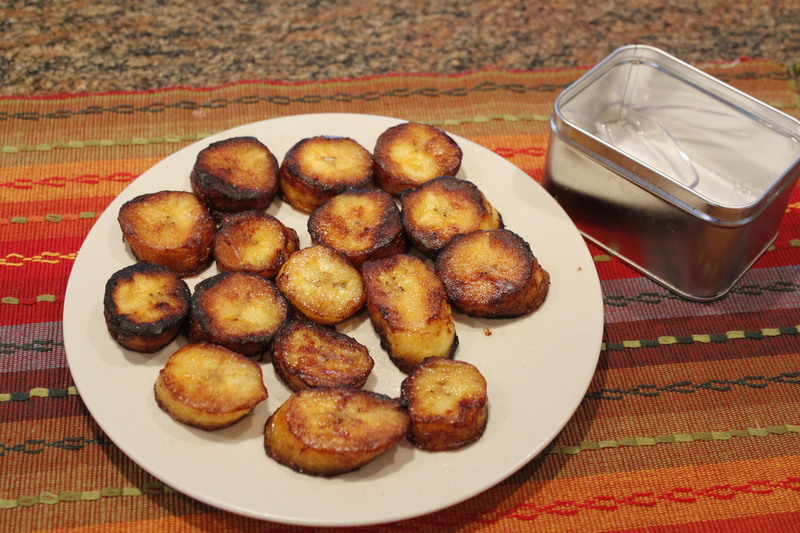 I have been addicted to fried sweet plantains ever since I tried them at Mami Nora’s Peruvian Rotisserie and have finally created a simple but sumptuous recipe that uses only 3 to 5 ingredients (ripe plantains, oil for frying, cinnamon sugar and sea salt) that takes less than 10 minutes to make. These are easy on the pocketbook as well — a large plantain is usually about 75 cents or even less, depending on where you shop. 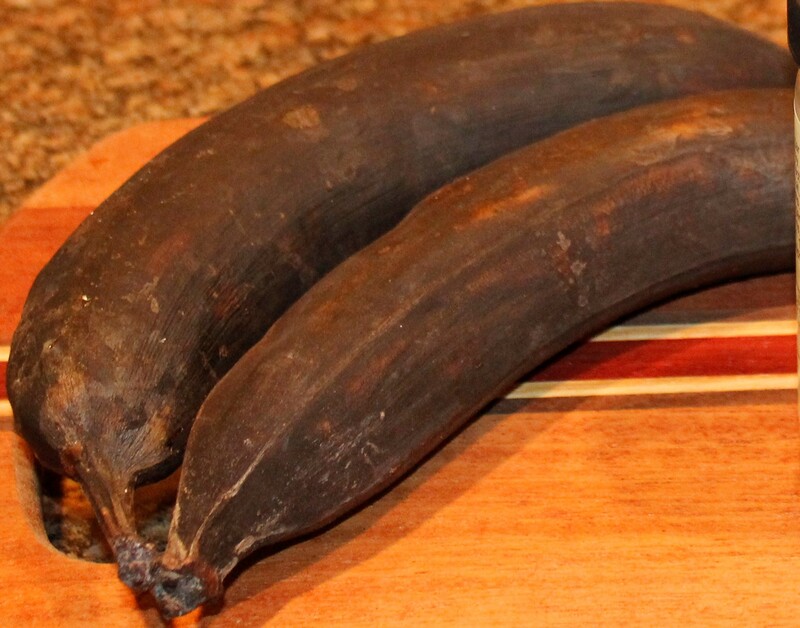 There are a few things you need to know about plantains. They are a member of the banana family but, unlike bananas, are starchy and low in sugar. They must be cooked (usually fried or baked) before serving. 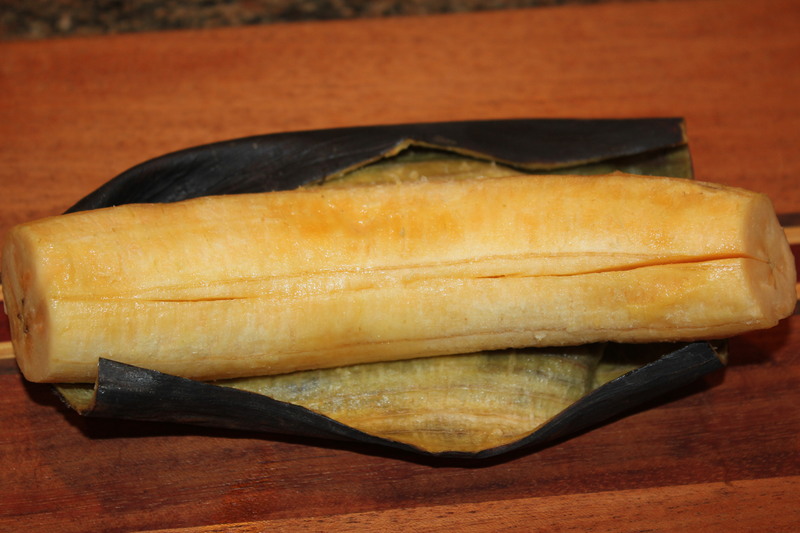 When a plantain is totally ripe, the peel is almost completely black. 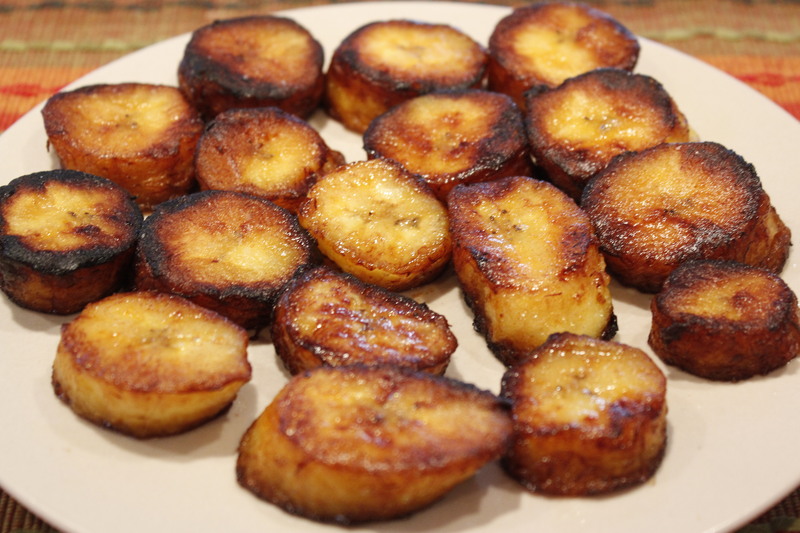 Ripe plantains are what I use in this recipe because their sugar content is the highest. 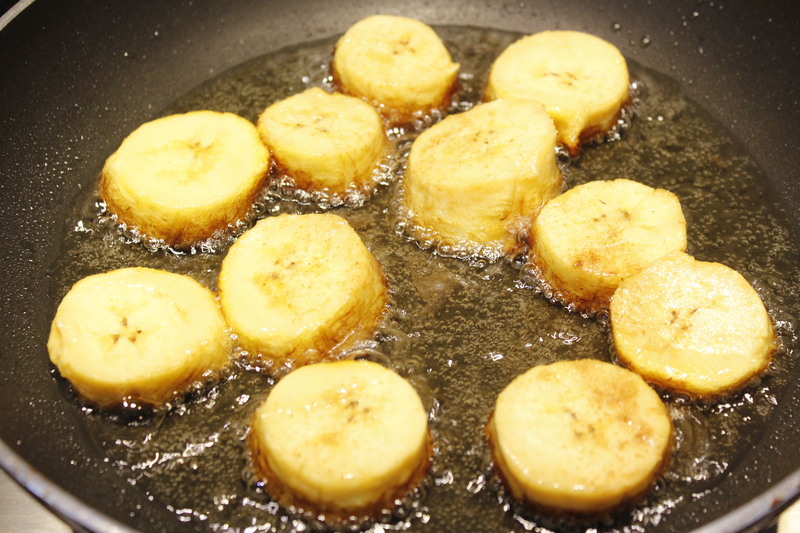 Always choose firm plantains, which you will find in the produce section of your grocery store. If you can’t find any black ones, then choose the green or yellow ones — it takes seven to ten days for green plantains to fully ripen. 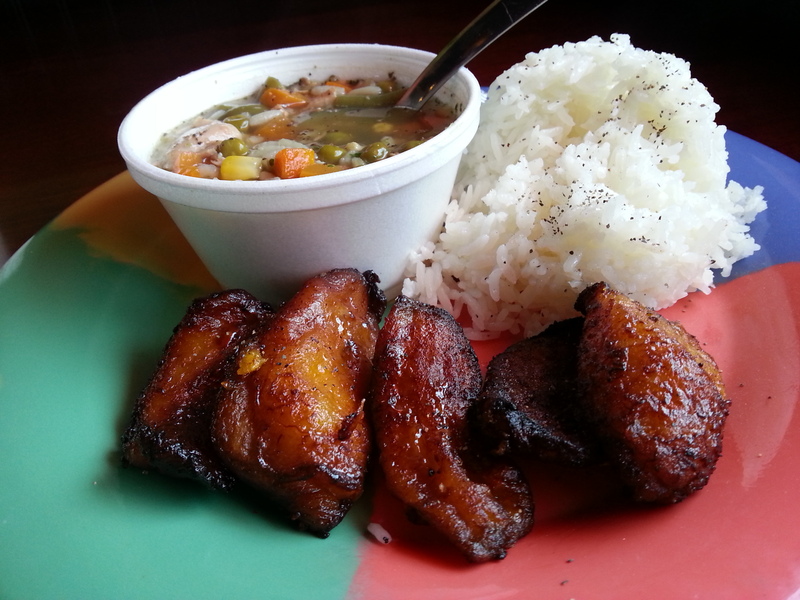 For more information on plantains, check out http://en.wikipedia.org/wiki/Cooking_plantain. Serve these wonderful sweet fried morsels with black beans and rice for a nice meatless meal, or just enjoy them as a snack, which is what I usually do. But be careful, because as I mentioned earlier, they are definitely addictive! In a skillet, heat the oil to medium high. Meanwhile, peel each plantain. The easiest way to do this is to cut off the ends and then make a slice just through the skin lengthwise down the plantain. Then you can easily remove the peel. Slice the plantain into rounds between ¼ and ½ inch (obviously I wasn’t paying attention to uniformity here.) Sprinkle each slice with the cinnamon sugar. 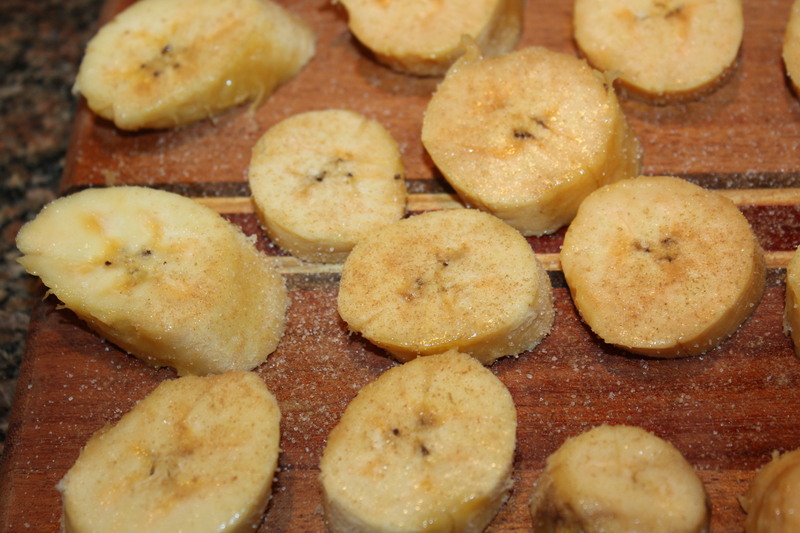 Place the plantains sugar side down in the heated oil and sprinkle the other sides with the cinnamon sugar. 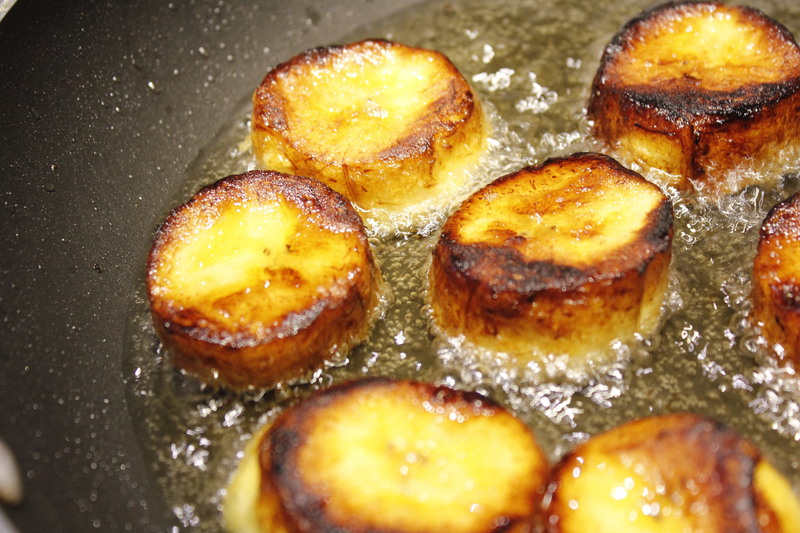 Fry the plantains about 2-3 minutes, until the sugar starts caramelizing and they turn nice and brown. Flip them over with a spatula or tongs and repeat. Shake off any excess oil and transfer to a plate. Do not try to drain these on paper towels — they will stick (yes, I learned the hard way!) You may want to place them on paper bags to soak up any extra oil, but if you shake them enough they should be fine. 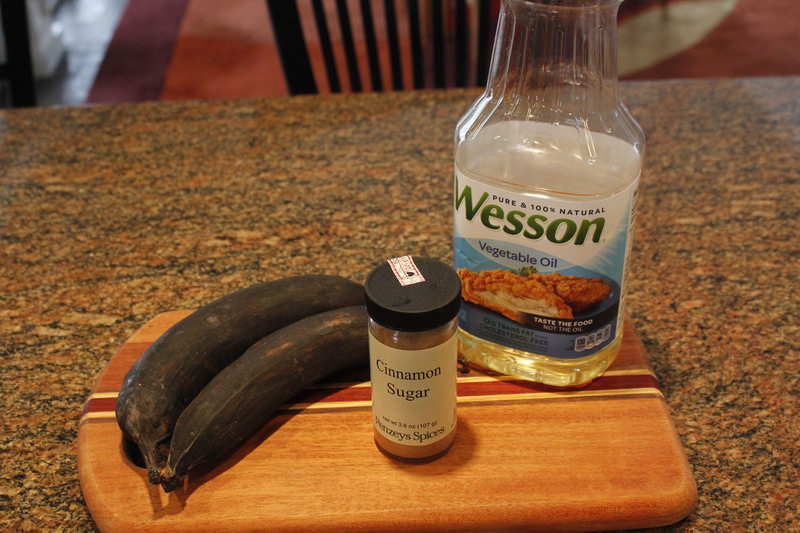 If desired, sprinkle the plantains with a little bit of sea salt. I love sweet and salty combined, so I recommend this step. I have made these using just brown sugar, but love the extra flavor that the cinnamon adds. I think you will, too! Here’s one way they serve these at Mami Nora’s – yum, yum! This entry was posted in Appetizers, Recipes, Vegetables/Vegetarian/Vegan and tagged eat drink and be merry, Kel's platanos maduras recipe, Kel's sweet fried plantains recipe, Kelley Chisholm recipes, Mami Nora's Raleigh Cary Durham restaurant review, Sweet and salty plantains, vegan recipes, vegetarian recipes. Bookmark the permalink.